And applied it with a MARSHMALLOW. You may have seen Ms. Yeah's viral videos on how she cooks lunch in the office using computer parts. Well, she takes her genius skills to a whole new level: She created makeup out of food. 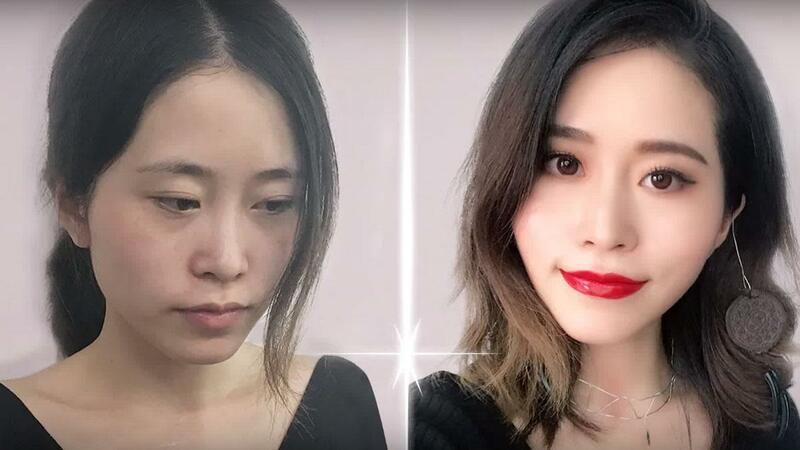 Using pantry staples like, cocoa powder, coffee, tomato sauce, and candy, the famous Chinese YouTuber put on a full face makeup—including eyeliner! For foundation, she mixed cocoa, glutinous rice flour, and sesame oil, which made us envious because girl got her skin's shade right. She then set her face using a marshmallow as a sponge. Randomly, she sees a chicken in the office and plucks a feather to be used as a tool to apply eyebrow makeup made from coffee! She then mixed cocoa powder with rice flour in varying proportions to produce different shades. The next step probably made me cringe and flinch—she used a ballpen as eyeliner. She even tightlined! Remarkably, Ms. Yeah even had time to make her own falsies using her officemate's hair. For her blush and glossy pout, she squeezed an arbutus fruit and mixed it with tomato sauce. Umm, I want *that* lip tint too. Watch the video below until the end to see how she also transformed her officemate's look from drab to fab using food and office supplies.